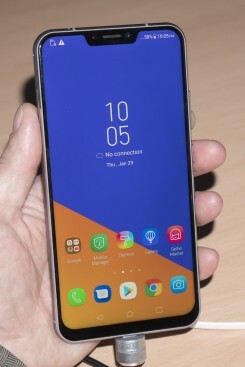 Zenfone 5 Lite / 5Q:Called the Zenfone 5Q in the US, this low end of the series has 2.5D curved class on the front and rear with a plastic frame in between. It boasts a 6-inch full HD+ 18:9 display. The Zenfone 5Q has four cameras, with an ultra-wide, 120-degree lens on each side. The main sensor on the rear captures 16-megapixel images, while the selfie camera has a Sony 20-megapixel sensor. It features a number of shooting modes, including portrait/bokeh. The phone is powered by a Snapdragon 630 processor and will come with in 3 GB / 32 GB and 4 GB / 64 GB configurations. The phone ships with a 3,300mAh battery. Other features include NFC, dual SIM, face unlock, speaker, and microUSB. Zenfone 5: The middle of the pack is powered by a Snapdragon 636 processor with 6 GB of RAM. It features a massive 6.2-inch display with a 19:9 aspect ratio with full HD+ resolution. It can automatically adjust the color temperature to suit its surroundings. The display features a notch, similar to the iPhone X, where it holds an array of sensors and more. Asus shrunk the size of the status bar icons to ensure they fit. Tapping them will drop the notifications down so they are all visible. The camera includes OIS and an aperture of f/1.8 for the 12-megapixel main camera, which has a Sony IMX363 sensor. The front camera has an 8-megapixel sensor with an aperture of f/2.0. The camera relies on AI-assisted scene detection to adjust for the subject. The company uses AI to improve the efficiency of the 3,300mAh battery, particularly when it is not being used. The phone includes stereo speakers and noise-cancelling microphones, DTS, and aptX. It will come with either 4 or 6 GB of RAM and 64 GB of storage. It supports dual SIMs and expandable memory cards. 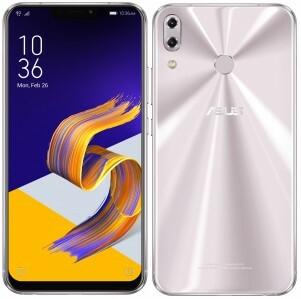 Zenfone 5z: The star of the series is the Zenfone 5z. It shares nearly all features with the Zenfone 5 — including an identical body externally — but it upgrades to the Snapdragon 845 processor from Qualcomm. Options will include 4, 6, or 8 GB of RAM and 64, 128, or 256 GB of storage. The Zenfone 5 Lite will go on sale in March, the Zenfone 5 will go on sale in April, and the Zenfone 5z will go on sale in June. The 5z starts at 479 Euro. Pricing for the 5 Lite and the 5 were not shared.